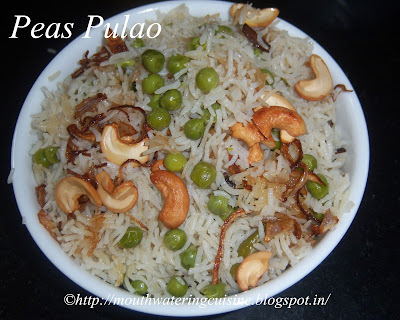 Peas pulao needs no introduction, a very simple and easy rice recipe. Kids also like it very much and makes a good lunch box dish. I got all accolades from my hubby for this simple dish. I don't know whether he likes it or not so I made it very less quantity. I made it for lunch today. Every time I make such kind of rice, I have to carry forward it for dinner. But this did not, we have finished it in one session only. I made it with the frozen peas. If we do it with fresh peas, really awesome. This can be made in a pressure cooker or in electric rice cooker. I cooked it in rice cooker. A very simple task. This can be made with ghee or oil. We can mix both - half and half - and make it. I wish to make it with ghee, but all ghee means the taste of ghee dominates and original taste dies. 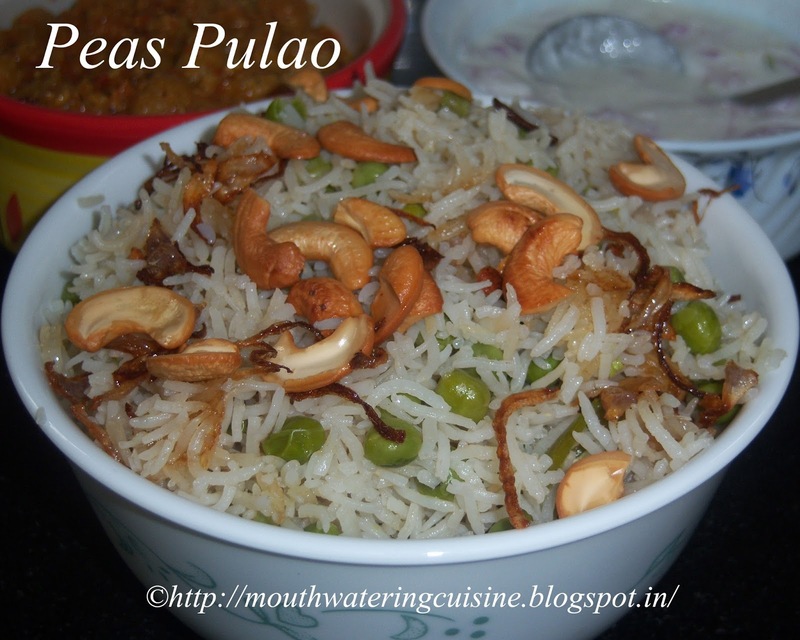 Serve peas pulao with onion raita or any spicy curry. I served it with meal maker curry. Slit chillies and chop onions. Heat oil in a kadai, fry cashew nuts till they turn brown. Keep it aside. Again heat oil in a kadai, fry onions till they turn crisp and brown color. Keep it aside. Heat oil and ghee in electric pressure cooker, add cloves, cinnamon and ginger garlic paste. Stir well and add soaked rice. Fry till the rice grains turns light brown color. Add in green peas. Fry for a while. Add 3 cups of water and salt. Cover and cook. If you are cooking in the rice cooker, turn it to cooking mode. Cook till it turns automatically to keep warm mode. Once it turns to keep warm mode, switch it off after five minutes. Stir well with a spatula and transfer it into a serving bowl. While transferring it add fried cashew nuts and onions. Serve hot peas pulao with onion raita.